Twenty-something architect Sophia couldn’t wait to escape to London, away from her childhood home in the country and her suffocating, boring parents. At least she always thought they were boring. After a strange phone call from her mother, Sophia returns to her parents’ home to discover her mother dead, hanging from a tree, and her father near to death, lying in a pool of his own blood. The police call it a murder-suicide. But Sophia can’t believe her mother would take her own life, and she starts to do her own investigations. 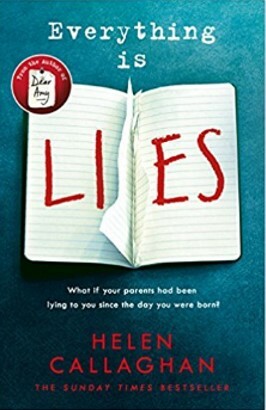 As she delves deeper into her mother’s past she discovers dark, hiddden secrets, and starts to realise that everything she ever believed about her parents is a lie. I have known the author of this book a long time, and seen her writing mature and improve over the years. This is always a wonderful process to see, especially when it culminates in a book as impressive as this one. Everything Is Lies is a near-perfect psychological thriller: beautifully written and utterly gripping, with a character you get emotionally invested in and an ending that creeps up on you and hits you over the head while you’re looking the other way. This book is an emotional roller-coaster, so-much-so, when I reached the end I had to sit quietly for a few minutes, to try and ground myself in reality again. There aren’t too many books that do that to me. Everything Is Lies is one of the first ‘must-read’ books of 2018, by an author who’s definitely on her way to great things. And I can say I knew her before she was famous.